There are entirely too many bread books and blogs with bread recipes...or not enough. One of my favorites is Carol Field's The Italian Baker. I was thinking of having the Babes bake her very complicated Panettone con Dotteri e Noci, a recipe that has intrigued me for a while. Once I realized that it is a laminated dough and that April and May can be too hot for laminated dough, I looked elsewhere for May's bread. 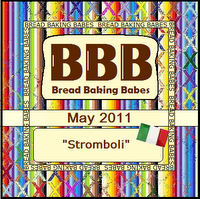 I'm inviting ya'll to gather round the kitchen table in May of the Bread Baking Babes 4th year and bake Stromboli. 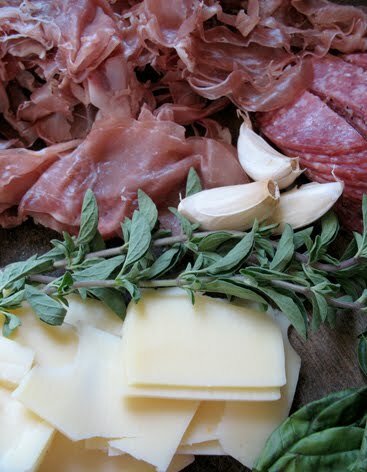 It's still Italian and should be delicious! It's getting to be picnic time, or will be by the time this bread gets posted, so I hope you'll enjoy it. The challenge for me with this one is to roll it up so that the whole thing doesn't unravel when sliced, a problem I've encountered with cinnamon breads. The dough itself is pretty basic but maybe that's OK because we can enjoy the product as much as the process this way. I found the recipe at Girlichef's blog. Heather has been a buddy in the past and this recipe was part of her celebration when she conquered her fear of yeast. If you go to her blog you can see the nice tight slices I hope for and look at that gorgeous sea salt and rosemary on top to say nothing of the filling. 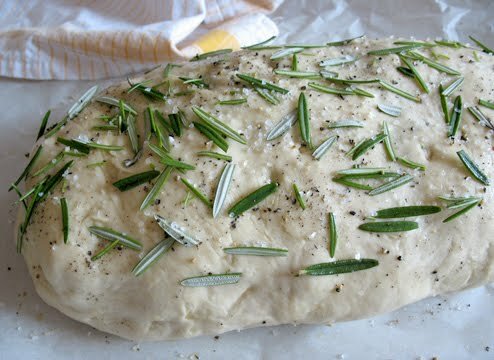 Bet this bread would go well with a glass of a hearty red wine. Join me? Here is the link to Girlichef's post. I used her photo, too, but will post my own once I get back home to my own computer in a couple of days. I brought a thumb drive with me on vacation, but it seems to be lost. It had the post I was going to do for this challenge and the photos, too. I do hope that you, dear reader, will be a Buddy this month. Just bake this lovely bread by June 26th and send me an e-mail (plachman at sonic dot net) with a link so that you can be included in the round-up at the end of May. In that spirit, I'm sending this over to Susan at Wild Yeast for Yeastspotting, the weekly yeasted bread extravaganza. Be sure to go there after this Friday for this week's entries. 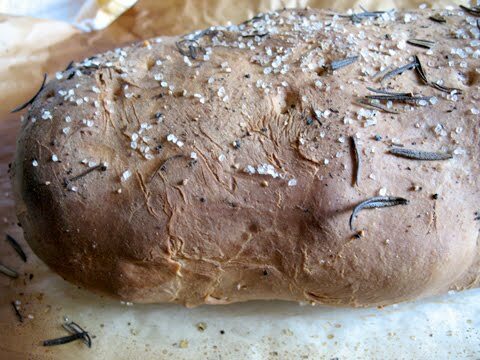 Also, be sure to check out the other Bread Baking Babes' blogs to see what they have done with this yummy and fairly easy bread. The links are to the right on the sidebar. Picnic anyone? P.S. After baking it myself, have added weights for most of the ingredients...in italics after the measured ingredient. Punch down and chafe* for 5 minutes. Let rest 10 minutes. Shape into a 14" x 8" rectangle. Cover w/ clean towel and let rest another 10 minutes. Drool, drool, drool! This looks so amazing! It's on the menu here for Saturday. If you're in the area, stop by and share! Thank you and Girl Chef! 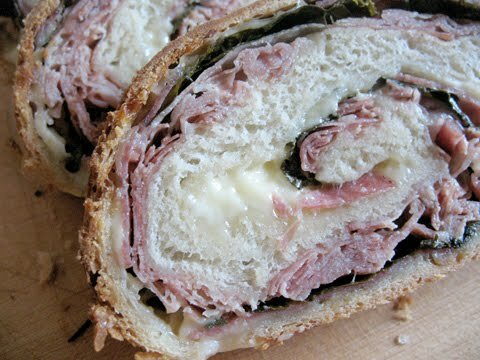 and Stromboli! This is one my man will be asking for over and over! Funny I don't think there are too many bread books or bread blogs ;-) I think the more the merrier! A very male bread... they loved it here! Thanks Elle! This looks SO delicious! I can tell that you're an expert at rolling sleeping bags. Nice and tight. Thank you (and Heather!) for a terrific bread this month. I love it! Looking forward to seeing your photo too. Looks delicious. I've got a couple questions. 1. you don't let it rise at all after its filled? and 2. you baked it a whole hour at 400? I usually bake a loaf like this for half that time. Wonderful bread, it's been devoured in one go here. Thanks Elle. We loved this! I had to really sell it to my man though - he seemed concerned that the filling would be steamed and watery. He was also alarmed at the lack of tomato sauce. But, of course, we both loved it. And I kept hearing "Do you want another slice? I do." and "Let's have this again." and "Mmmmmmmm". Thank you Pat and Heather! Lynn, if I hadn't just returned from the East Coast I'd be there to share with you! Natashya, can't beat having fun...very glad you did, too. Tanna, Your hubby has good taste...but of course since he picked you...and likes Stromboli, too. Baking Soda, it IS a guy kind of bread, isn't it? Susan, your version had my mouth watering...all thanks go to Heather for such a great recipe. Coleen, the oven is preheated before you roll it all up, then skewer it and right into the oven. I think if you let it rise more you would get more air pocket problems. It gets baked for a long time because the heavy filling is distributed throughout, so takes longer for heat to get into the center (I would guess). Perhaps making longer, thinner loaves would make it possible to have a shorter baking time. Lien, Yeah, it went fast here, too. Seems to be that kind of delicious addictive food we love to bake. Elizabeth, I thought I'd need to have some tomatoe sauce to dip the bread in, too, but it seems to be fine just as it is. Heather, you are the star of this challenge...great recipe, everyone loves it especially the guys and I suspect it will become a regular bread that is baked often. My thanks to you! Looking forward to seeing how your turns out this time. Great photos! You got the perfect bread-to-filling ratio. looking yummy! that's what we'll eat tonight even though everyone will now wait for me to go to the grocery store, knead and also for the dough to rise! haha..
We just had this again the other night, Elle. The only change we made was to add some fresh tarragon to the filling (our neighbour's tarragon is already going crazy in her garden and she's not a huge fan of tarragon - lucky us!!) The stromboli was easily as delicious. But now I'm kicking myself for still not trying it with the fresh rosemary on top.